I was lucky enough to get a manicure recently with CND's newest launches, their Trilogy Top Coat Collection and their new Shellac and Vinylux Collection - Glacial Illusion. The cool icy tones are PERFECT for the winter months and with the shades available in Shellac and Vinylux, there's no reason to ever have chipped nails again :). I usually use Shellac on my nails because keeping up with my son means that I'm very rough with them and I have no time to worry about them chipping. I was SO EXCITED to see the Trilogy Top Coat Collection, which includes a Matte, Glitter and Pearl Top Coat that can be used with any of their Shellac colours! I tried Mystic Slate (from the new Glacial Illusion Collection) with the Glitter Top Coat (how pretty is it!?). Most women have heard about Shellac, but I was really surprised to find out that many of you have never heard of Vinylux! I've been using Vinylux for years and rely on it for those times when I can't make it to my manicurist. I love that it allows me to get a nail salon look at home, without the nail salon price :). Vinylux, by CND, is a long wear weekly polish that you can do at home with the same shine as Shellac, but with no UV or LED lights needed! All you need is the Vinylux colour and the Vinylux top coat... you'll have gorgeous long lasting polish for up to 7 days! As a new mom, regular polish rarely lasts longer than 24 hours on my fingers... and that's assuming I even have time to let it dry. If you watched my Instagram stories then you saw my daily updates when I used Vinylux and saw that it didn't chip! I changed nothing in my routine and this polish withstood my daily #momlife (which includes LOTS of dish washing without gloves and lots of messy cleanups). That's a win in my book! CND is always coming out with new colours in Shellac and Vinylux, but the Glacial Illusion Collection may be one of my favourites yet. The colours, from left to right, are: Ice Bar (Obsessed with this colour), Cashmere Wrap, Radian Chill, Alpine Plum, Mystic Slate (LOVE THIS ONE) and Winter Nights. 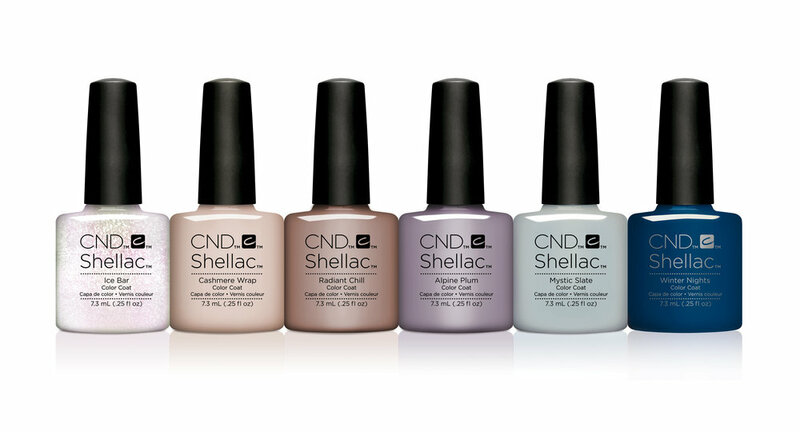 Visit cnd.com to find a salon near you or for more information on these amazing new launches!